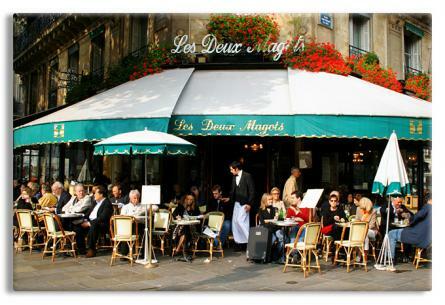 Les Deux Magots is a famous café in the Saint-Germain-des-Prés area of Paris, France. It once had a reputation as the rendezvous of the literary and intellectual élite of the city. This is derived from the patronage of Surrealist artists, intellectuals such as Simone de Beauvoir and Jean-Paul Sartre, and young writers, such as Ernest Hemingway. Other patrons included Albert Camus and Pablo Picasso.